Blacktie Cardboard Photo Folder for 4x6" Picture. BLACK with GOLD Foil Border (PACK OF 400). Classic & Elegant! This 4x6 paper photomount is ideal for wedding, graduation and photo booth events. Cardboard Photo Folder for 4x6'' Picture. BLACK with GOLD Foil Border (PACK OF 400). Classic & Elegant! This 4x6 paper photomount is ideal for wedding, graduation and photo booth events. by Eventprinters at Marco Marcucci. MPN: blacktie-gold-4x6-400pack. Hurry! Limited time offer. Offer valid only while supplies last. Black Photo Folder with Gold Foil Accent Around Photo. For Vertical 4x6 inch photo. STC brand (exclusive by Eventprinters). Pack of 400 folders. 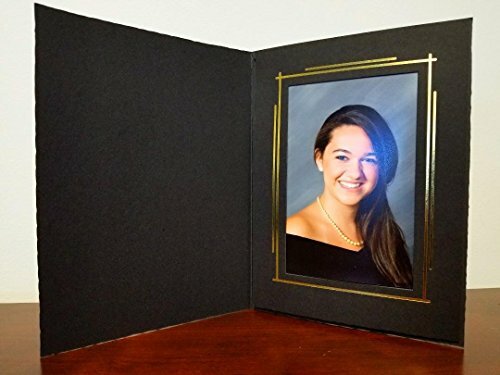 Black Photo Folder with Gold Foil Accent Around Photo. For Vertical 4x6 inch photo. STC brand (exclusive by Eventprinters). Pack of 400 folders. Holds 1 (one) photo per folder. These elegant 4x6" photo folders are bottom-loading (flap) - Quick load design. Great for event photographers. This 4x6 black portrait folder is perfect for weddings, graduation, sweet sixteen, corporate events and all kinds of social events. CONTACT US IF YOU NEED A SAMPLE. CONTACT US IF YOU NEED A SAMPLE. Black Photo Folder with Gold Foil Accent Around Photo. For Vertical 4x6 inch photo. This 4x6 black portrait folder is perfect for weddings, graduation, sweet sixteen, corporate events and all kinds of social events. CONTACT US IF YOU NEED A SAMPLE.